We picked ten colorful bath bombs with different scents, so it’s up to you to find your favorite and make it at home. With the right packing, you can give a bath bomb to someone special as gift as well. 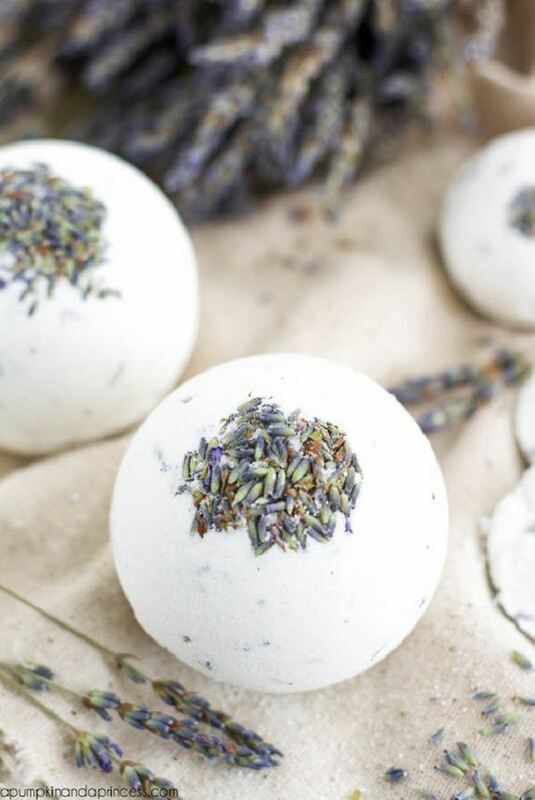 For these bath bombs you need the following supplies: 1 cup baking soda, 1/2 cup Citric Acid , 1/2 cup cornstarch, 3 tablespoons epsom salt, 2 teaspoons sweet almond oil , 3/4 teaspoon water, 15 drops lavender oil, few tablespoons of dried organic lavender flowers and plastic ornament or silicone mold. First combine baking soda, citric acid, cornstarch, epsom salt and dried lavender, then in a small bowl combine almond oil, water, and essential oil. Mix these two together until all the ingredients are well combined. Don’t put too much water or it won’t form into a ball correctly. Freeze for at least two hours and let dry overnight. 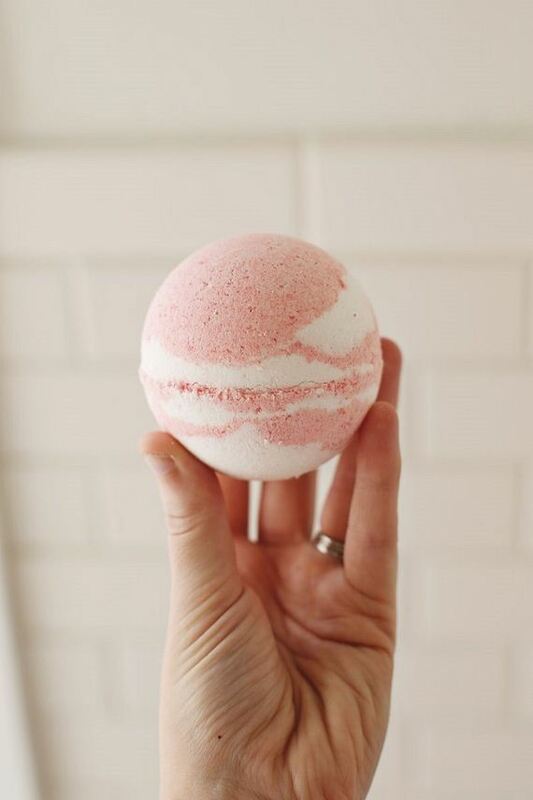 These colorful bath bombs surely look like small planets! For these ones you need 1 cup citric acid, 2 cups baking soda, 1 cup cornstarch, powdered food color, 10 – 20 drops total of cosmetic grade fragrance oil or essential oil, 1 tsp sweet almond oil, spray bottle filled with water and 3D Round Ball Mold. 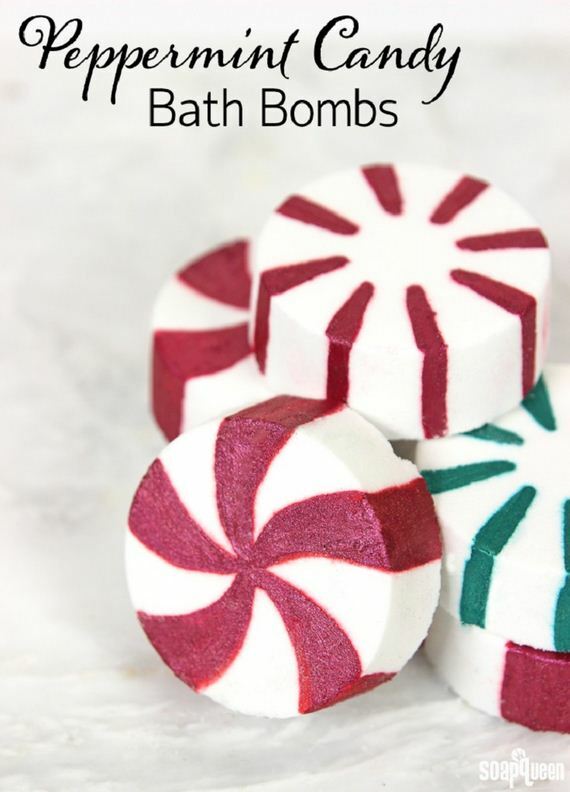 These bath bombs are going to be the perfect gift for anyone, especially for children. They will look toy alike to them because of the colorfulness and if you have problems getting your kid to bath, maybe this will help! Yes, you can even use tea as your ingredient. 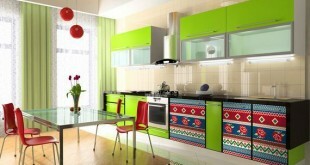 In this case, you will need large mixing bowl, spoon, 16 oz. baking soda, 8 oz. anhydrous citric acid, 8 oz cornstarch, 8 oz. 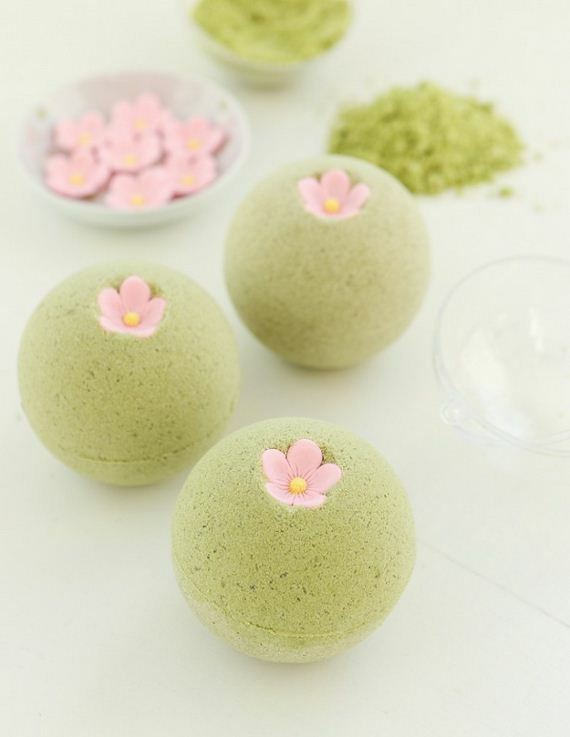 epsom salt, 1/4 cup powdered green tea, 2 Tbsp avocado oil, 2 Tbsp water, 2 tsp cherry blossom fragrance oil or essential oil, 4 large, hollow plastic ornaments and 4 pink flower icing decorations. Considering the fact that the green tea is one of the most healthiest beverages, it’s good to include it even in your bath routine. The cherry blossom fragrance oil will give the most wonderful scent that will make you feel as if you made a small piece straight from Japan. 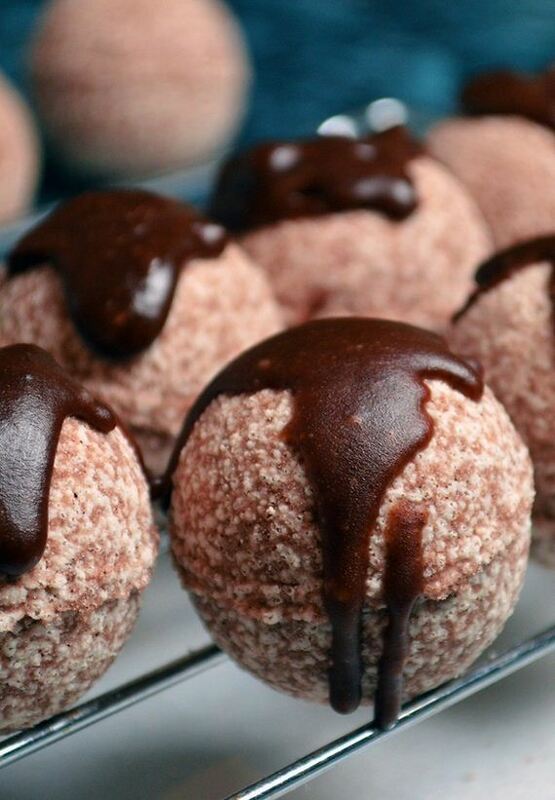 A bath bomb with the scent of a chocolate and the look of a truffle – except that it’s not a dessert. If you use it for your kids, make sure they don’t mistake it for food! To prepare them, you need 1/2 cup/110 g Citric Acid, 1 cup/300 g baking soda, 1 Tbsp/7 g Kaolin White Clay, 2 tsp/8 g organic cacao powder, witch hazel, 1/4oz/8 ml chocolate fragrance oil or cacao (chocolate) essential oil. You can also use ordinary cacao powder instead organic and when it comes to the chocolate part, the fragrance oil is less expensive and is a perfume, while the essential oil is natural. The following recipe is only for the bath bombs, so if you want more you can easy double the ingredients: 4 oz. baking soda, 2 oz. corn starch, 2 oz. citric acid , 2 oz. Epsom salt, 1 to 1 1/2 teaspoons water, 1 teaspoon essential oil , 1 1/4 teaspoon oil (coconut or olive oil) and 1-2 drops food coloring, but this is optional. There are three flavors included – lavender, lemongrass, and peppermint. 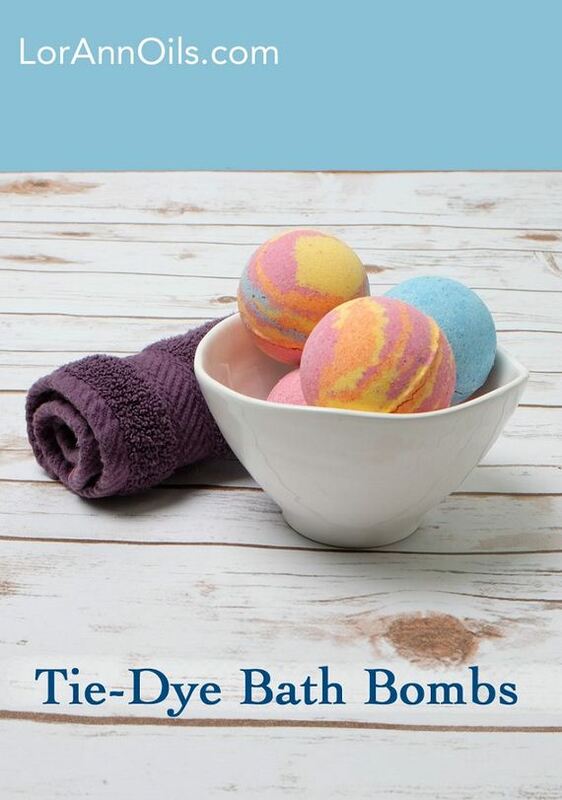 If you want a two – tone bath bomb, just mix the batter in separate bowls and then in only one add food coloring. 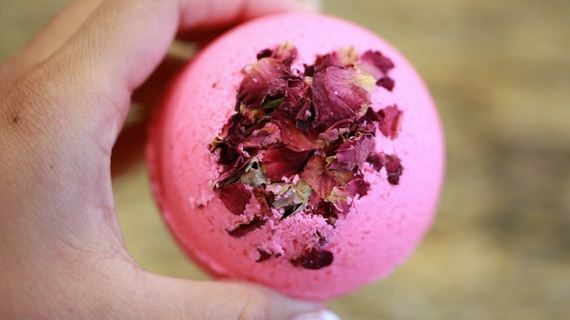 Aren’t these bath bombs the perfect pink thing? It’s impossible not to simply want at least one for your bath. If you want to make it, make sure you have these: bath bomb mold, 1/2 cup baking soda, 1/4 cup citric acid, 1/4 cup corn starch, 1/2 cup epsom salt , 1 teaspoon water, 2 teaspoons vitamin e oil, 3+ drops of food coloring, 3+ drops of essential oil, dried up roses or other flowers, whisk, large bowl, measuring cups and measuring spoons. 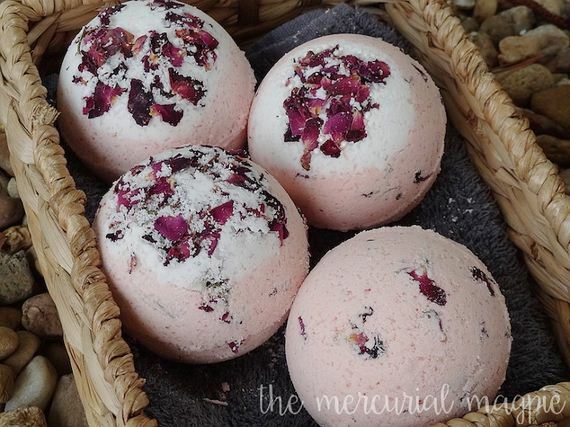 The dried up roses make the bath ball look amazing, plus with essential oil they give away such nice scent. Another rose bath bombs, if the previous weren’t enough. Just go to your local store and buy these ingredients: 1 cup baking soda, 1/2 cup cornstarch, 1/2 cup citric acid,1/2 cup salts (I used 1/4 cup of Epsom Salts and 1/4 cup Sea Salt), 2 teaspoons essential oil by your choice, 2-4 tablespoons oil of your preference (start with 2 tablespoons of oil and add more into the mixture if it’s not well – combined in the circular molds) and a few drops of food coloring (optional). You will also need a spray bottle filled with water, silicone or candy mold of your choice, dried rose petals (optional), towel and parchment paper. Candy look alike bath bombs aren’t something you see every day! Because of their similar look to candy, they will look as such fun and interesting gift to get. 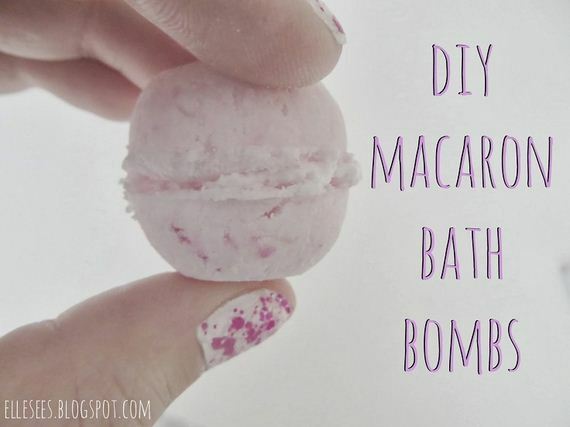 So, next time when you’re going on a birthday of a close person who likes diy projects, consider these bath bombs. They are made of 2 cups baking soda, 1 cup citric acid, 4 ml peppermint essential oil, 1st distill, 3 ml vanilla non-discoloring fragrance oil, .3 oz. argan oil, .3 oz. polysorbate 80 (optional), witch hazel, shamrock mica, Merlot Sparkle mica, Cellini Red Mica and 99% Isopropyl Alcohol. They look so French, so pink, and so adorable – except that they’re not real macarons. But, it’s worth making them! You need 1c baking soda, 1/2c citric acid, 1/2c cornstarch, 2 tablespoons sweet almond oil, 2 tablespoons witch hazel or water, 5 drops almond essential oil and 10+ drops of soap colorant. You should use half circle molds, because regular maracon molds won’t be helpful. Also, be aware that if you’re experiencing any skin conditions, it’s better to consult a doctor before using homemade treatment. 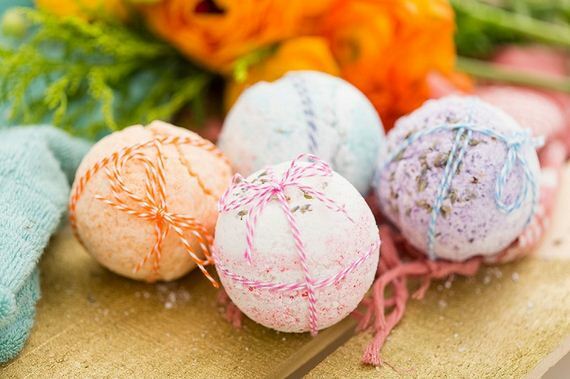 Last, but not least – these colorful bath bombs prove what a good gift they can be. Make sure you have 1 cup baking soda, 1/2 cup cornstarch, 1/2 cup citric acid, 1/2 cup epsom salt, 3 teaspoons water, 3 teaspoons coconut oil (melted), essential oils, food coloring, dried flowers or dried lavender and bath bomb mold. Once the bath bomb is well – dried, you can use baker’s twine to tie them around and give them to someone special.